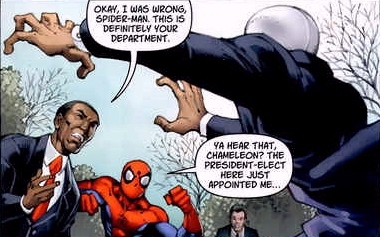 In The Amazing Spider-Man #583, Spider-Man stops The Chameleon from replacing Barack Obama so the supervillain could be sworn in as President instead. 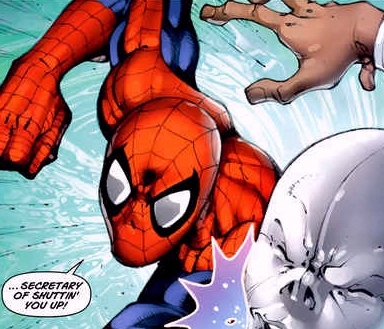 Spider-Man: Well, THAT was unpleasant. I hope this doesn't ruin the inauguration for you. Barack Obama: Honestly, I'm more upset by the Chameleon's shockingly deficient understanding of the electoral process. 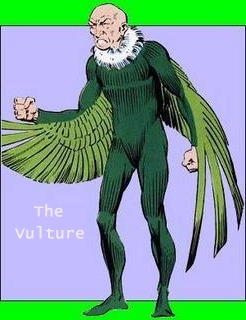 But Spider-Man refuses to hang around, saying "I think Biden's still mad I confused him for The Vulture on the train that one time." 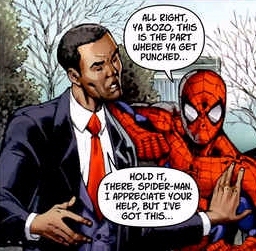 "Guess it's time to head back to New York," Spider-Man says at the end. "It looks like Washington's in capable hands..."